Join us for a spin-in! The meeting will include a potluck meal (please bring a dish of your choosing to share), a brief update from our board, and lots of enjoyable crafting and social time. There may even be door prizes! The annual Guild dues are $20, but please feel free to come check out a meeting to see if you’d like to join. The February meeting will be held at the Hardin County Extension Office. 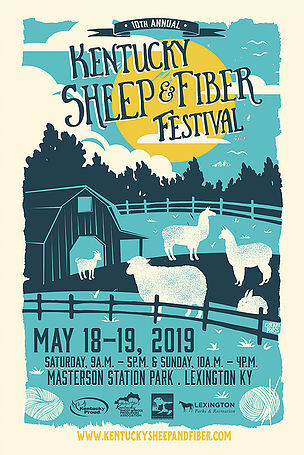 Join us for a casual spinning demo at the KY Sheep and Fiber Fest! The demo runs throughout the course of the festival. You can sign up to demo part of a day, a whole day, or even both days. Someone is always there to watch the equipment and participants are welcome to come and go as they please - we want everyone to be able to enjoy the festival! Contact Martha Richard at weaverscorner@bardstowncable.net if you would like to participate. The June meeting is actually a weekend-long retreat organized specially for members! If you’re interested in signing up, please sign up for our newsletter for additional information. A single room is $84 per night, and a double room is $106.40 per night, taxes included. Meals are $8 each. Come, relax, and enjoy on the beautiful grounds of the St. Meinrad monastery. The July meeting will be held at the Franklin County Extension Office, Room G. Go down the hill behind the building and use the back entrance for easier access! The August meeting will be held in the Garden Pavilion, which is located just off the to right once you’ve entered the park. Be sure to tell the gate keeper that you’re with the Guild so that you don’t have to pay admissions to the park! 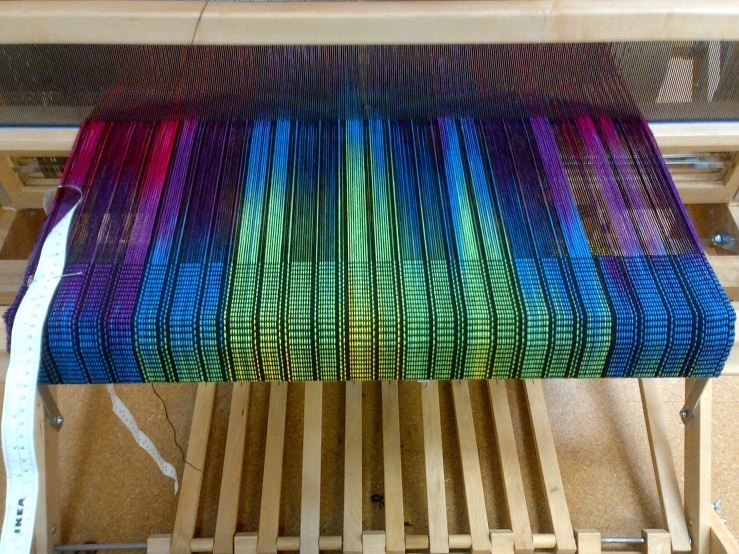 The cost for members is $150, plus a $72 materials fee that includes a 4.5 yard, 300 thread hand-dyed warp. For workshop details, click here. Please contact Sandy Duffy at fsfibers@gmail.com to sign up. This is a MEMBERS ONLY event! The cost of the class is subsidized by the guild, so signups are only available to current members. This workshop is taught by Kathrin Weber, who has been dyeing and weaving professionally for over 40 years. The cost for members is $100, plus a $35 materials fee that includes a personal dye kit and handouts. The September meeting will be held at a member’s home, so please sign up for the newsletter for additional information! The November meeting will be held at the Franklin County Extension Office, Room G. Go down the hill behind the building and use the back entrance for easier access. November is also the annual member market, where members can buy, sell, and trade anything fiber-related. It’s a lot of fun, and you can get some great deals! The April meeting will be held at Weaver’s Corner, a studio space owned by one of our members. The March meeting will be held at a member’s home, so please sign up for the newsletter for additional information! The February meeting will be held in the Garden Pavilion, which is located just off the to right once you’ve entered the park. Be sure to tell the gate keeper that you’re with the Guild so that you don’t have to pay admissions to the park!